Aberdeen and St Johnstone played out an entertaining 2-2 draw as long serving Saint Chris Millar celebrated his testimonial at McDiarmid Park. Saints made a perfect start as they scored after just five minutes through David Wotherspoon, the midfielder running on to Richard Foster’s through ball before firing past Joe Lewis in the Aberdeen goal. The lead lasted just three minutes, however, as the Dons swept forward to score the equaliser. 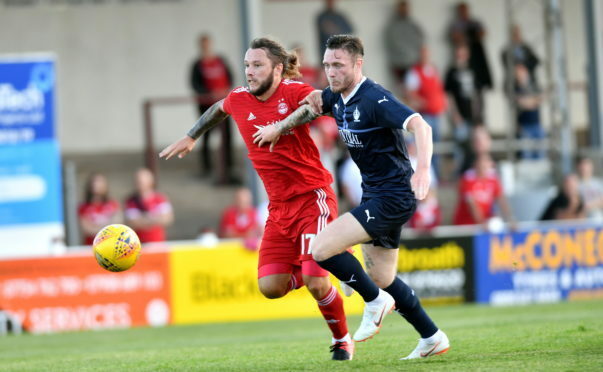 Stephen Gleeson and Lewis Ferguson combined to create the opportunity for Stevie May and the former Saints striker clipped the ball over the advancing Zander Clark. The Dons took control of the game and their pressure paid off when they took the lead through Scott Wright. The winger made the goal by himself too, spinning away from his marker before beating another Saints defender and racing into the box and beating Clark. St Johnstone had a great chance to draw level in the 63rd minute when Liam Craig headed a free kick down into the path of substitute Greg Hurst but Dons defender Andy Considine did well to clear the ball off the line before the Saints sub could convert the loose ball. Saints were not to be denied their equaliser, however, and substitute Hurst got it when he beat Mikey Devlin before firing past Lewis.